Just as there are many colors contained in one visible spectrum, a variety of shades are present within one racial spectrum: the human race. 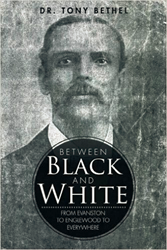 In his memoir, “Between Black and White,” Dr. Tony Bethel traces his family lineage, beginning with his great-great-great-grandmother Nidra as a slave shipped to the United States from an African tribe; to his slave ancestors who migrated from North Carolina to West Tennessee in search of better lives; to his own youth growing up in the Chicago neighborhood of Englewood in the ‘60s and ‘70s; to present day as a loving father and grandfather of an ever-growing, multi-racial family tree. Throughout his detailed account of his ancestry, Bethel notes that while many “mixtures” of African Americans are present throughout American history, records documenting African slave lineage are very limited. In his book, Bethel emphasizes that one’s identity is not exclusively determined by genetic factors, and that everyone, regardless of skin color, is interconnected. “If we can learn to embrace our own heritage and reconcile our past with our present, I believe we can learn to live in harmony with one another,” Bethel said. Dr. Tony Bethel is a U.S. Navy veteran, massage therapist and doctor of naprapathic medicine, focusing on nutritional counseling, manual therapy and care of the developmentally disabled. He has written three books of poetry, including one with his son Brian titled “Father and Son: A Connection through Poetry.” Bethel is also a distant cousin of “Roots” and “The Autobiography of Malcolm X” author Alex Haley. Visit Dr. Tony Bethel for more information. This entry was posted in Award, celebrity, honoree, Recognition and tagged 2015, African American, Alex Haley, author, autobiography, Black and White, December 1st, Dr. Tony Bethel, father and son, Navy, poetry, roots, speaker, Today's Honoree, Tuesday, writer. Bookmark the permalink.